Joel Kim Booster and Patti Harrison to Host New Digital Series at Comedy CentralThe show will cover the week’s news through the lens of social-media reactions. 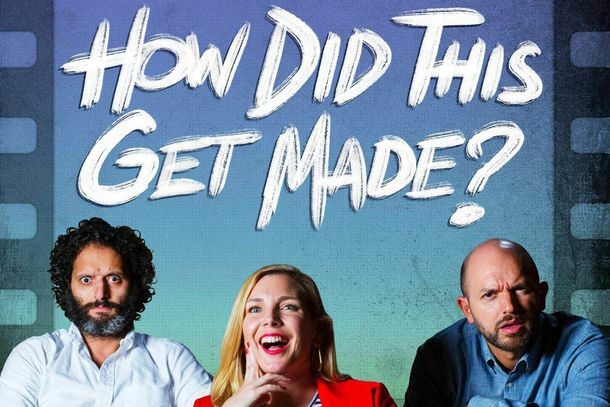 Want to Try Scheer, Raphael, and Mantzoukas’s How Did This Get Made? Start Here.If you like bad movies and good podcasts, HDTGM is for you. Paul Scheer and Rob Huebel Once Performed at a Wedding and It Was TerribleBut they were paid in food, which was nice. Paul Scheer on His Breakout Parody and Nicolas Cage’s Surprising SmellOn a new episode of Good One, Paul Scheer talks about “The Illusionators,” the Criss Angel parody he co-created with Aziz Ansari. Listen to Paul Scheer’s Insane Stories About Russell Crowe and Criss AngelOn a new episode of Good One podcast, Paul Scheer explains how a Criss Angel parody changed his life. Party Over Here Canceled, Never to Be ‘Here’ on Fox AgainThe sketch show, created by the Lonely Island, lasted ten episodes. Maron, Lapkus to Headline Now Hear This FestivalThe event will take place October 28–30 this year. Paul Scheer and Rob Huebel Have a New ShowIt’s scheduled to air later this year. Here’s the Lineup for This Year’s Vulture Festival!It’s bigger than ever! Paul Scheer Explains What Mustache to Wear Out“Grandpa’s Party” sounds fun. Aziz Ansari Posed With The Hills CastHuman Giant goes to L.A. When Paul Scheer Got the Brush-Off from Robert Downey Jr.In our second “Pop Culture Memory Lane” installment, the NTSF star tells of his very uncomfortable Comic-Con encounter with Iron Man. Read a Rob Corddry and Paul Scheer InfographicSo, basically, who hasn’t been on Children’s Hospital? Watch Paul Scheer Audition for 50 Shades of GreyWell, the fangs definitely don’t hurt his chances. Watch Paul Scheer Introduce His Breaking Bad Blog, Breaking GIFs, Outside, in His UnderwearHe pronounces it “jifs,” soft “G”! See a Comprehensive Chart Detailing the Hardest-Working Actors in SitcomsIs there a show you love that hasn’t featured Megan Mullally? Nope. No, there is not. Video: Vulture Chats With The League Cast, Learns Who Talks the Best SmackAlso: who’s drinking whose urine, and more! Adult Swim Orders Another Season of Paul Scheer’s NTSF:SD:SUVSorry, bad guys! Meet Vulture’s Guide to Comic-Con’s Weirdest Sights: Paul ScheerAs he departs for SDCC with his camera, he picks the five most bizarre things he’s seen in years past. Industry Roundup: IFC Acquires Yves Saint Laurent Doc for a 2011 ReleasePlus, ‘Harry Potter’ breaks Imax records. Watch Paul Scheer Dispense Fantasy-Football AdviceIncluding a whacked-out reason why a black man should choose a player named Arian. Watch Paul Scheer Explain How Volkswagens Cause MalariaThe ‘Human Giant’ visits Africa in the guise of baffled voice-over artist J. Montgomery Scott. Watch Aziz Ansari, Rob Huebel, and Paul Scheer’s New Human Giant SketchStunt Kidz! Twitter Scandal! Live-Tweeting Comedians Disrupt the Sanctity of Crank 2: High VoltageThe event was theater sanctioned and all tweeting was restricted to the back rows so as not to disturb other moviegoers. Even so, ALL HELL BROKE LOOSE. At Long Last, Brandon Flowers Opens Up About Shaving His ’StachePlus: Kristen Stewart isn’t sure she enjoys how commercial Sundance has become. T.I. Finally Solves Internet Piracy Through Brute ForcePlus: Paul Scheer speaks truth to power on the ‘Die Hard’ series.